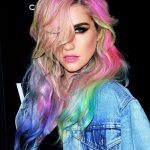 Kesha‘s professional recording career began in 2005 after she was signed with a label. She was just 18 during this period. She waited a few years before she got her break as a singer, which was in Flo Rida’s “Right Round” where she was a featured artist. In 2010, she released her first studio album Animal, which cemented her success as a singer. The album spawned the hit singles “Tik Tok” and “We R Who We R”. The song “Timber”, her collaboration with Pitbull, was also a huge success. In 2012, she released her second album Warrior, spawning the hit song “Die Young”. As a songwriter, she wrote the song “Till the World Ends” for Britney Spears. After some legal disputes with her ex-producer, she returned to making music in 2017 with the release her third album Rainbow. Its lead single was “Praying”. She was nominated for a Grammy for both the album and the song.